The Latino Business Chamber of Greater Los Angeles hosted the sold out event as part of its 4th Annual Latino Business Award Luncheon held Feb. 21 at the Millenium Biltmore Hotel in downtown Los Angeles. The award luncheon honors Latino owned businesses that are innovative and making a difference in their field or their community, according the chamber’s chairman and CEO, Jorge Corralejo. He said the matchmaking event was an opportunity for small to midsize businesses to make new business contacts and to develop relationships with Fortune 500 corporations and federal agencies. Participants engage in face-to-face meetings with buyers and procurement executives, where they were able to share information about their company, perhaps getting on a company’s radar for the very first time, he explained. Jeff Vigil, president and CEO of My Business Matches, the company hired to coordinate the event, said matchmaking allows smaller businesses to get together with corporate executives they would otherwise have no opportunity to meet. It’s “sort of like a speed dating scenario,” Vigil said. 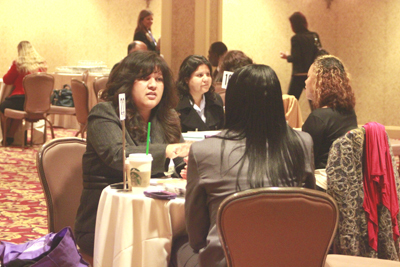 The event brought in large companies and public sector participants such as Goldman Sachs, Bank of America, Wells Fargo, Edison, LAX airport and AT&T; all looking to increase diversity in their company. They don’t just want to increase supplier diversity, they want to increase diversity with suppliers who can do the job,” Vigil said. Georgia Zachary was at the event representing AT&T, and told EGP that her company participated in the matchmaking in hopes of finding minority vendors to do business with. “The interaction of sitting down with someone talking about their business, it’s a little bit better than going online and filling out an application. It just makes a difference,” Zachary said. Zachary sat down and interviewed potential clients like Renee Peña, the regional manager of a broadcasting company who attended the event to network with potential advertising customers. According to V. Nenaji Jackson from Goldman Sachs’ 10,000 Small Businesses Program at Los Angeles City College, the focus on the coveted Latino business market is what attracted the company to the event. “Los Angeles has one of the largest Latino populations and certainly one of the largest Latino business populations in the country, so this is a perfect event for us,” Jackson said. Angelica Urquijo was there in hopes of meeting some large companies that might be interested in attracting the Latino consumers through services offered by her consulting firm. “This is providing entrepreneurs, male and female Latinos, access to these big companies, access to millions and billions dollars in contracts because they are in front of the decision makers,” Urquijo explained. Marketing consultant Alex Manriquez told EGP that it was her first time attending such an event, and she was hoping the connections she made would lead to future contracts. She said events like the Latino Business Chamber’s matchmaking session help level the playing field by putting her in contact with large companies that she would not normally have access to. The experience, she said, provided her with direction and insight. Vigil told EGP they will track the results of the Chamber’s event once companies log on and share how many contracts they made and how many jobs were created through the matchmaking.